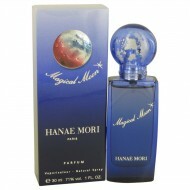 Launched by the design house of Hanae Mori in 1995, HANAE MORI is classified as a sharp, oriental, w.. Launched by the design house of Hanae Mori in 1998, HANAE MORI is classified as a refreshing, orient..
Awaken your senses with a spritz of Hanae Mori Eau De Collection No 6, a new and enticing women's fr..
Hanae Mori Haute Couture was launched in 1998 by the design house of Hanae Mori. A gentle floral fra.. HiM is a new fragrance from the famous house of Hanae Mori, released in 2012. This rugged, masculine..
A floral oriental fragrance with notes of osmanthus flower, rose, sugar cane, cotton flower, coconut..